I've quit holding classes on specific dates becuase it seems like the dates were always wrong for people. What I'm doing now is teaching private lessons. These aren't any more expensive, I just teach whenever people want to learn and that works well for me. Sometimes folks who have already built a kayak with me will come out here and get some training, other times it's people who want to try a skin-kayak and get a bit of instruction in the process. You can bring your own kayak and paddle if you want to! My sea kayaking instructional program is designed to blend modern and traditional sea kayaking skills with a focus on skin-kayak specific considerations. Skin-on-frame kayaks have been my only sea kayaks for over six years now. I use them for everything except whitewater rivers. The purpose of these classes is to provide a solid introduction to the use of skin-on-frame kayaks while upholding generally accepted safety standards. There is a strong focus on the mentoring ethic, people teaching each other and learning together. While these classes are mostly utilized by kayak building class students, I do have kayaks and gear around the shop for those who don't own a kayak yet. Come experience what you can do with a twenty-five pound kayak. This class offers a solid basic introduction to outfitting, navigation, self rescue, fitness, and boat handling skills. I give a detailed lecture on choices in kayaking gear so you can learn what you really need to buy, what you can get by with, and which products are worth purchasing and which products are junk. Next we'll take a look at a safe, well outfitted kayak, I'm a minimalist so don't expect a lot of fancy, expensive gadgets. We will discuss basic kayak navigation and how to make informed judgements on what is and isn't safe, as well as exploring some of the hidden risks involved in sea kayaking. I will share some of the fundamentals of effective fitness training so you can apply those concepts to your everyday paddling. 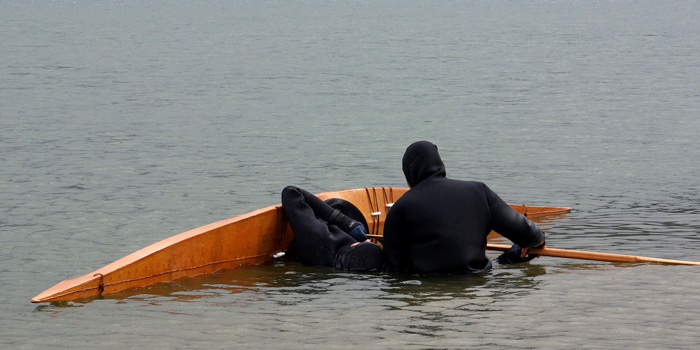 After this we head onto the water where we'll practice strokes and rescues and I will teach you the fundementals of teaching yourself how to roll and do eskimo rescues so you can face capsize without wet exiting the kayak. If you're expecting to hop into a traditonal Greenland hunting kayak and use it just like your modern sea kayak you might be in for a few surprises. This kayak was designed to hunt seals in arctic waters and using a Greenland kayak means going on a cultural kayaking journey. In this class you'll learn how to train your body to support you comfortably in the Greenland sitting position (legs straight out in front of you), minimizing the risk and discomfort of lower back injuries. We will practice safely entering and exiting the tight cockpit on the water and on land. In the water this class is focused on teaching traditional rescue skills, we'll practice sculling, bow rescues, bracing, and I will show you how to combine these basic elements into a system you can use to teach yourself and others how to roll. I'm continually amazed by the amount of crap people can stuff into the hatches of fiberglass sea kayaks, and those same people watch me warily, certain that I must be somehow suffering when I arrive at camp. They must imagine me huddled underneath a tree, eating cold tuna fish, shivering beaneath tiny tarp. Not so! On a trip down Utahs Green River, a friend and I left our kayaks and set off to hike several days into a rugged remote area. I pared our packs down to twenty-five pounds apiece. After setting up the tent and rolling out the Therm-a-Rests, that evening we cooked a fine meal and while she drank a second glass of wine, I asked, "are you uncomfortable? ", "No" she replied, "are you unhappy? ", "no", "then tell me", I asked, "what is all that crap we left in the sea kayaks?". It is exactly this question that this class seeks to answer. By learning what you can comfortably do without you'll experience freedom as the kayak becomes lighter and packing becomes easier. Learn valuable tips and tricks gathered over many years of camping in skin-on-frame kayaks. For this all day class I'll arrive with my kayak completely packed and ready for an overnight camping trip. While we paddle to a nearby location we'll discuss some of the paddling considerations for overnight camping. When we arrive I'll make camp completely, and cook lunch. After we eat lunch we'll break camp and return home. Each step of the way we'll analyze time management, packing, unpacking, and setup strategies. The goal of this class is to significantly reduce your gear loads and to significantly reduce your setup and breakdown time so you can spend more time enjoying the outdoors. You CAN learn to roll, but will you? Probably not. Like most sea kayakers you are probably lazy. You probably took a class once in a pool and it didn't work so now you whine about how it's too hard and instead you keep a cell phone in a ziplock bag and a paddlefloat on deck and a handful of those useless kayakers flares. You get worried every time the waves get a little bouncy, you are a liability to yourself and others. You will never see the truly beautiful places that only someone who rolls can visit. Kayaking is all about freedom, but you aren't free, you're just a monkey in a little boat. What's that you say? You're not lazy! How dare I say these mean things, it's not fair, you have a job, you're busy. OK, here is the real scoop on kayak rolling. It takes about as much time as a 3 credit college class to get a roll that is rock solid. That's about six hours a week for a few months. Sure you can roll the kayak in just one or two sessions, but to be able to roll reliably in real conditions takes a little longer. When you commit to learning to roll I will commit with you. I will stay with you the whole way, I won't give up on you no matter what it takes, and I won't abondon you regardless of your ability to pay me. When you come for your first session we will get you on the water and most of the time, actually get your first roll. Then I will give you homework, videos to watch, and exercises. When you come out again I will test you, and I'll know if you did the homework. If you did then I'll move you up to the next level, you'll go home and train more, come back and I will test you again, and so on until you get it. Like a kung-fu warrior, your final test will happen when you are ready. You will become one with the water. I will push you, you'll throw a gentle brace. I will force you over, you will calmly scull to the surface and take a breath, then roll. This isn't the violent, overpowered, shoulder wrenching roll we see all too often. This roll is gentle and sweet. This roll will work in real life on either side, in any boat, in any conditions. How much does it cost? That doesn't really matter to me. It's important that you pay something because I've found that people who don't pay anything have very low commitment levels. What matters is that you are committed and stick with the training. Teaching rolling is not something I do for money, it's something I do to give back to kayaking. When you are ready to spread your wings I'll be here to teach you to fly. Call me to begin the training.